Every now and then, our local news includes stories of our poor fellows who were victimized by some devilish illegal recruiters, who instead of helping of our "kababayans" to reach for their goal, stole their money and runaway and victimized more. This is one sad story that Philippine Overseas Employment Administration (POEA) and JobStreet.com want to end - and they mean it! 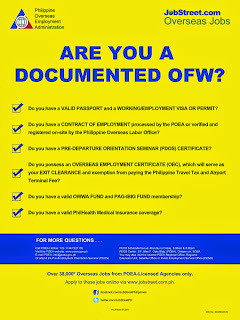 In a recent press conference of JobStreet.com and POEA, held at POEA PST Hall last June 5, a resounding pledge “Matalino ako! Hindi ako magpapaloko!” echoed all over the place as they launched their latest battle against illegal recruiters in the land. 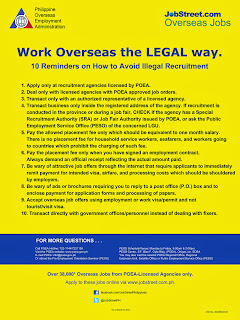 To promote “safe and real jobs” for overseas intenders, POEA partnered with the number one job site in the Philippines, Jobstreet.com, last February 2013 in pursuant of the 2013 Anti-Illegal Recruitment. POEA Administrator Atty. Hans Cacdac discussed to us the series of co-branded educational resources that will empower 2013 Anti-Illegal Recruitment and let everyone knows the do's and don't's in overseas employment. 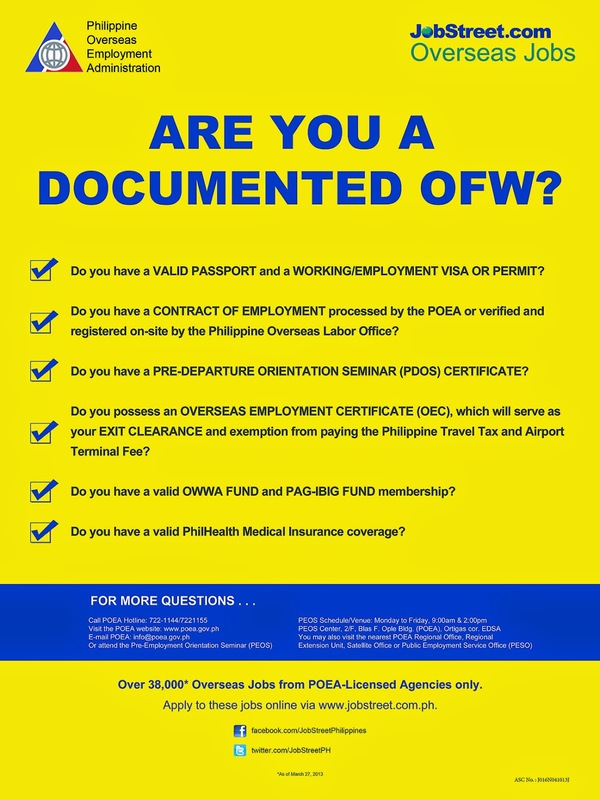 Included in the partnership is a series of online and offline materials on Anti-Illegal Recruitment spread out to the various POEA-licensed recruitment agencies and jobseekers nationwide. 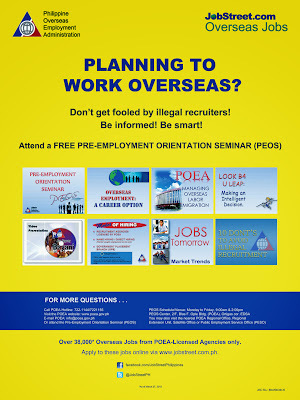 These materials are said to highlight the Top 10 Reminders to Avoid Illegal Recruitment, Pre-Employment Orientation Seminar (PEOS), and Frequently Asked Questions (FAQs) on overseas employment. Administrator Cacdac said that the 2013 Anti-Illegal Recruitment program aims to ensure the safety of both the overseas workers and their respective families. 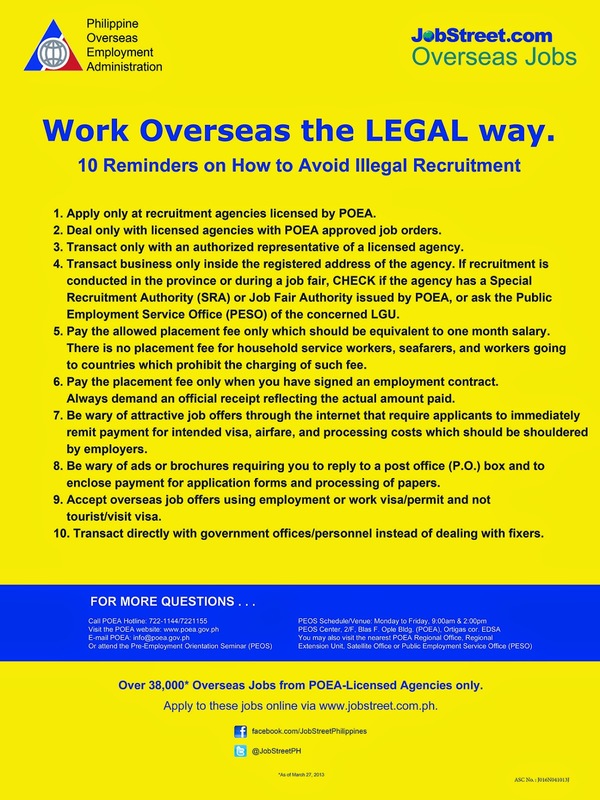 The POEA partnered with private entities like JobStreet.com is a breakthrough that will put everything in its right place, including illegal recruiters who deserve no other place than to be behind the bars. Based on POEA statistics, in 2012 alone, 152 cases of illegal recruitment involving 312 victims have been filed with the POEA, a story that they want to end this 2013 through the help of everyone.